The Wednesday morning murders of 24-year-old Roanoke TV reporter Alison Parker and cameraman Adam Ward, 27, were a racist atrocity, a racial hate crime. Were they not white, they would be alive today. Their killer, Vester L. Flanagan II, said as much in his farewell screed. He ordered his murder weapon, he said, two days after the slaughter of nine congregants at the African-American AME church in Charleston, South Carolina. “What sent me over the top was the church shooting,” said Flanagan. To be sure, racism does not fully explain why Flanagan, fired from that same WDBJ7 station, committed this act of pure evil. Black and homosexual, he said he was the target of anti-gay slurs from black males and racial insults from white colleagues. He had gotten himself fired from other jobs in broadcasting. He carried a grab bag of grudges and resentments. Other news organizations downplayed the racial aspect. But had those murdered journalists been young and black, and their killer a 40-something “angry white male,” the racial motivation would have been front and center in their stories. Now, Black America is surely as sickened by this horror outside Roanoke as was White America by the Charleston massacre. But it is hard to see how and when we come together as a people. For racial crimes and race conflict have become “the story” that everyone seizes upon — since Ferguson in the summer of 2014. On the first anniversary of Michael Brown’s death, protesters blocked public buildings in St. Louis and St. Louis County, shut down I-70 at rush hour. In Ferguson, hoodlums rioted and looted for days. What justification was there for such lawlessness? Left out of most stories was that Brown, 18, had knocked over a convenience store, throttled a clerk half his size, and was unarmed only because he failed to wrest a gun away from Officer Darren Wilson, whom a grand jury declared had acted in self-defense when he shot the charging 290-pound Brown. Since then, we have had the Eric Garner incident on Staten Island, where a 345-pound black man, suffering from diabetes, asthma, obesity and heart disease, died of heart failure after being wrestled to the ground by five cops, none of whom was charged. Came then the death of Freddie Gray in Baltimore, while in police custody. There, six officers have been charged. Then came the death of a 12-year-old black kid in Cleveland, who was waving a toy gun. As the incidents pile up, with white cops shooting black suspects, and black criminals killing white cops, the news goes viral and America divides along the lines of race and color, and between black and blue. Though, let it be said, the violence in Ferguson and Baltimore was child’s play compared to Watts in ’65, Detroit and Newark in ’67, and D.C. and 100 other cities after Dr. King’s assassination in 1968. “Can we all get along?” pleaded Rodney King, when South Central exploded in rioting, arson and looting after the L.A. cops who had beaten King were exonerated. For what seems certain, ensuring that our racial divide widens and deepens, is that more incidents like those involving Michael Brown, Eric Garner and Freddie Gray are inevitable. First, violent crime, declining since the early 1990s, is rising again. And violent crime in black communities is many times higher than in the white communities of America. Collisions between black suspects and criminals and white cops are going to increase, and some of these collisions are going to involve shootings. And such shootings trigger fixed, deep-seated beliefs about cops, criminals and injustice, they also cause an instantaneous taking of sides. Moreover, this is the sort of “news” that instantly goes viral through the Internet, Facebook and 24-hour cable TV. 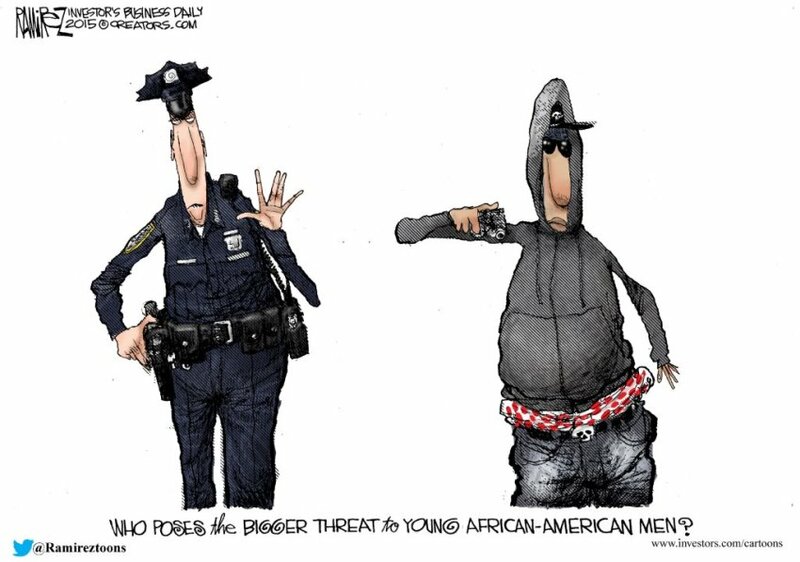 Liberals and Democrats take sides with the black community out of solidarity and to solidify their political base, while Republicans stand with the cops, law-and-order conservatives, and the Silent Majority in Middle America. The race issue has even begun to split the Democrats. When former Maryland Governor Martin O’Malley, a card-carrying liberal, attended a conference of Netroots Nation and responded to a chant of “Black Lives Matter!” with the more inclusive, “Black Lives Matter! White Lives Matter! All Lives Matter!” he was virtually booed off the stage. O’Malley proceeded to apologize for including the white folks. To many Americans, even many who did not vote for him, the election of Barack Obama seemed to hold out the promise that our racial divide could be healed by a black president. Even Obama’s supporters must concede it did not happen, though we would, again, argue angrily over why. Patrick J. Buchanan is the author of the new book The Greatest Comeback: How Richard Nixon Rose from Defeat to Create the New Majority .